The recent announcement from Shaw Industries that it intends to acquire USFloors demonstrates the increasing demand for wood-plastic composite (WPC) flooring in the US. 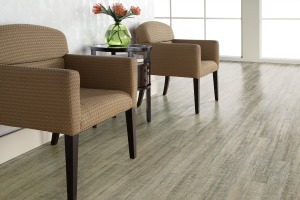 WPC flooring — which consists of luxury vinyl tile (LVT) with a WPC core that serves as a backing — was introduced to the US by USFloors in 2013. This flooring’s attractive appearance and durability caused it to quickly gain acceptance among interior designers and homeowners. Seeking to capitalize on its popularity, several other hard surface flooring manufacturers developed their own lines of WPC flooring. While several firms now offer WPC flooring, USFloors’ CORETEC PLUS product line — the first on the market — has become nearly synonymous with the entire category. Thus, the acquisition of USFloors demonstrates Shaw’s interest in being a leading provider of high-quality hard surface flooring products. Originally introduced as a variation on LVT, WPC flooring offers a number of benefits that have spurred the installation of the material in residences, hotels, and other facilities where attractive flooring is desired. With both standard LVT and WPC flooring anticipated to see strong demand growth, Shaw’s acquisition of USFloors will position Shaw to be a leading supplier of these products to both residential and commercial consumers going forward. The new Wood-Plastic Composite & Plastic Lumber study has the overall industry growing nearly 7% annually reaching $6 billion in 2020. For more information about WPC flooring, see Wood-Plastic Composite & Plastic Lumber by The Freedonia Group. This comprehensive industry study presents historical demand data, forecasts, market environment factors, industry structure, and company market share — critical information for business leaders who are seeking to outmaneuver the competition. For more information about LVT flooring, click to the industry study Hard Surface Flooring.